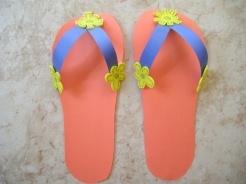 These Summer Flip Flops are a creative summer craft for kids. Decorate your flip flops in what ever embellishments you have around the house. 1. Trace and cut out your foot prints on a piece on construction paper. Cut two strips of paper about 1/2" to 3/4" wide. 2. Tape or glue the straps of your flip flops onto your foot prints. Start by taping both straps to the top and then to either side, buckling them up as you tape them. 3. Add embellishments to your sandals where the straps meet the foot prints, and anywhere else your choose! Make a whole bunch of these and hang them for a great summer party decoration!